Reaction Motors Lox/Ammonia rocket engine. Out of production. The first large, man-rated, throttleable, restartable liquid propellant rocket engine, boosted the X-15A. First flight 1959. AKA: LR99. Status: Out of production. Number: 339 . Thrust: 262.40 kN (58,990 lbf). Specific impulse: 276 s. Specific impulse sea level: 239 s. Burn time: 90 s. Diameter: 1.42 m (4.65 ft). 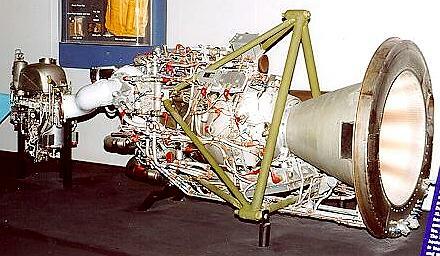 The XLR-99 was the first large, man-rated, throttleable, restartable liquid propellant rocket engine. The throttle setting could be varied from 50 percent to 100 percent of thrust, and the restart capability allowed it to be shut down in flight with the assurance that power would be available later if needed. The XLR-99 was used in the X-15 manned research rocketplane and was developed and built by Reaction Motors Division of Thiokol Chemical Company. The propellants were liquid oxygen (LOX) and anhydrous ammonia, fed into the engine by turbine pumps at a flow rate of more than 4,500 kg per minute. The XLR-99 engine had a rated operating life of one hour, after which it could be overhauled and used again. Operating times twice that long were demonstrated in tests. Each XLR-99 was capable of between 20 and 40 flights before overhaul (The X-15A carried fuel for 83 seconds of full-power flight; the X-15A-2 carried fuel for more than 150 seconds of full-power flight). In common with other large scale liquid fueled rocket engines, the walls of the XLR-99's thrust chamber were constructed of hollow tubing through which fuel was routed to cool the chamber walls before being burned in the engine. The XLR99-RM-1 Rocket Engine Development Program originated with a NACA study of an advanced research airplane utilizing a liquid rocket engine. When this program was approved as the X-15, a committee, composed of USAF, Bureau of Aeronautics and NASA representatives, made a survey of all rocket engines available and in development. As a result of this study, three engines were selected which were best suited as a starting point for meeting the X-15 engine performance requirements and the X-15 airplane schedule. These were the Bell XLR81-BA-1, Aerojet XLR73-AJ-1, and the Reaction Motors XLR30-RM-2. Final selection of the X-15 power plant was made by the airframe manufacturer. North American Aviation won the X-15 airframe competition and included the XLR30-RM-2 rocket engine as part of the winning proposal. The development of the X-15 engine on an associated contractor basis and supply of necessary engines as GFE was the procurement policy established for this program. The engine contractor was Reaction Motors Division of Thiokol Chemical Corporation (RMD). The development program began February 1956. Early component tests proved the XLR30 rocket engine to be inadequate as a starting point; therefore, a completely new design was initiated and designated the XLR99-RM-1 rocket engine. Thrust (sl): 227.300 kN (51,099 lbf). Thrust (sl): 23,174 kgf. Engine: 415 kg (915 lb). Chamber Pressure: 40.82 bar. Area Ratio: 9.8. Thrust to Weight Ratio: 64.4920327868853. Coefficient of Thrust vacuum: 1.87489910824557. Coefficient of Thrust sea level: 1.63479910824557. Country: USA. Spacecraft: X-15A, X-15B, X-15A-2, X-15A-3, Mini-shuttle. Propellants: Lox/Ammonia. Stages: X-15A stage, X-15A-2 stage. Agency: Thiokol.